In the heart of the hamlet a magnificent ensemble with origines dating from the 12th century and was the property of a flax merchant (marchand de lin). It is composed of a house with 160 m² of living space with Ground floor: fitted and equipped kitchen, lounge/living room with wonderful fireplace, 2 bedrooms with own shower room and WC, boiler rom with WC. First floor: 3 more bedrooms with their own shower and WC. The loft is used as a study and games room. Plus loft for potential conversion. The guest house offers 60 m² with Ground floor: fitted and equipped kitchen open onto the living room with beautiful fireplace, WC. First floor: 2 bedrooms and bathroom with WC, Loft above. Outbuildings: workshop, barn, old cattle shed. The property sits on 3700m² beautiful garden with a lovely view to the south. Nearby is a parcel of land of 6200m². Magnificently renovated in the pure tradition and respect of the materials used with respect to the age of the property and its origins. 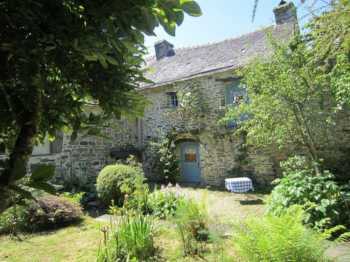 It offers the possibility of gite or chambres d'Hôtes. Situated in the heart of the Parc régional d'Armorique... nbot far from the Lac du Drennec and a number of sentiers de randonnée. Toiture : Ardoise de Pays.